Am I Eligible for a Brow Lift? The average patients seeking a brow lift or forehead lift procedure falls between the ages of 40 and 70 years old. Everyone ages at his or her own pace, so there is no specific age where a brow lift becomes necessary. Furthermore, some patients are more proactive and may seek treatment, while others wait until later in life to correct the effects of time and gravity. Beyond aging, hereditary factors can also play a role in how quickly your collagen production slows. All of a sudden you find yourself bothered by a sunken brow. Whenever you're ready, looking at consultation for your brow lift is the first step toward a more youthful appearance. Once the lines and wrinkles have begun to form along your forehead, between your eyebrows, and around the eyes, the aging process has begun and you may find yourself with deeper and deeper lines as time goes on. If you have a naturally low and heavy brow, aging can cause sagging even earlier. To be considered a good candidate for a forehead left, you should have experienced some of these symptoms already. In addition, you should be in good physical health, not smoke, and have a reasonable expectation for your surgery. Meet with a plastic surgeon for consultation about your potential brow lift to discover if you are a good candidate for this procedure. What Should I Expect a Brow Lift? During your consultation, your facial plastic surgeon will explain his or her approach to the brow lift procedure. The endoscopic brow lift is the most popular procedure because it is the most effective treatment for a sagging brow. This approach is preferred because of the extremely small inconspicuous incisions utilized. The endoscopic brow lift procedure begins with four or five small incisions along the scalp, each less than an inch in length. Next, your facial plastic surgeon will use an endoscope, a pencil-like camera that is connected to a television monitor. He or she will insert it under your incisions in order to gain a clear view of your skin and where he or she is able to work with the muscles and tissues to achieve your desired results. Other surgical instruments will be used, all inserted through the same incisions. The underlying tissue and muscles will be lifted upwards and tightened as needed, resulting in a lifted brow and smoother appearance to the face. How Can I Learn More about Brow Lift Surgery? A brow lift surgery could be the answer to your aging troubles, as it fights time and gravity to achieve a more youthful look. 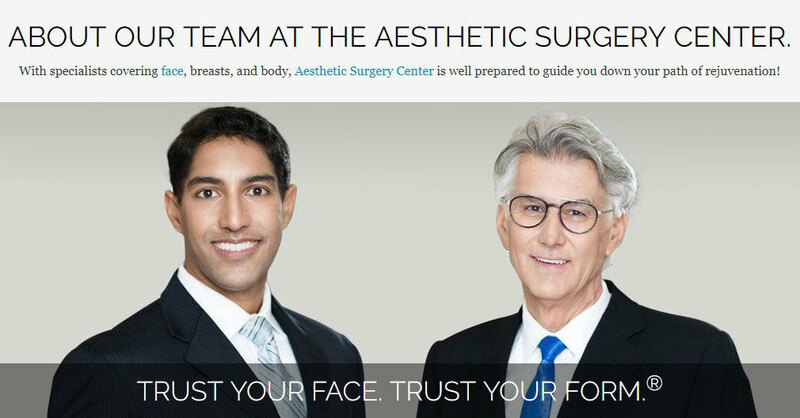 To get more information about how a forehead or brow lift surgery might benefit you, contact the Aesthetic Surgery Center to book an appointment with Dr. Anurag Agarwal or Dr. Richard Maloney, our double board certified facial plastic surgeons. They have been featured on many of the major news networks, including ABC, NBC, and FOX, as recognized experts on a variety of facial plastic surgery topics. Dr. Agarwal and Dr. Maloney believe that educating and communicating with their patients are the keys to helping them achieve successful, natural-looking results. Book your appointment at the Aesthetic Surgery Center, located at 11181 Health Park Boulevard #1115 in Naples, FL, by calling (239) 594-9100.